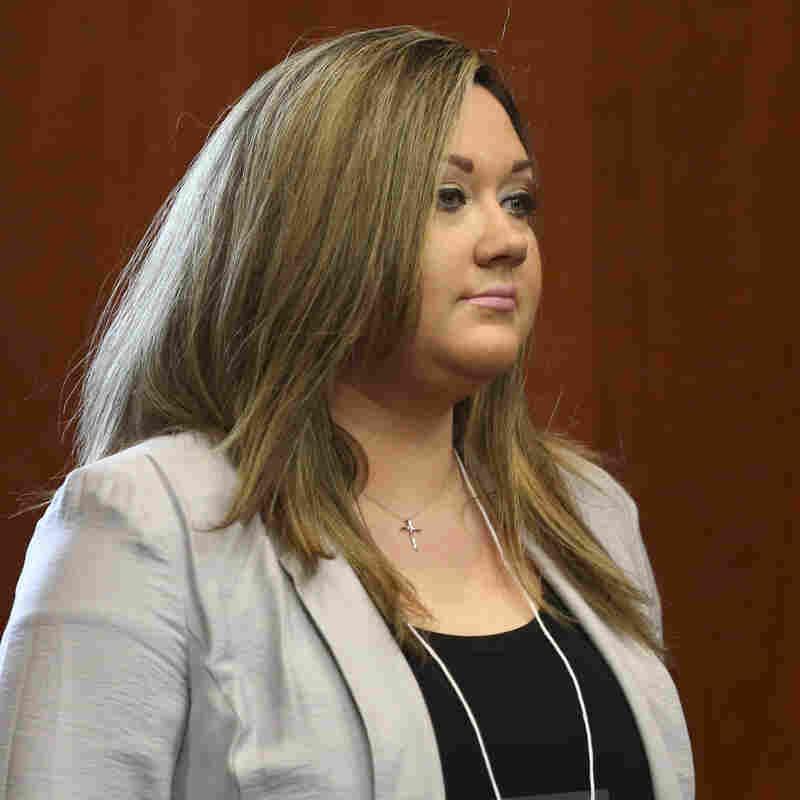 Probation For George Zimmerman's Wife On Perjury Charge : The Two-Way Shellie Zimmerman pleaded guilty to a misdemeanor charge related to statements she made about her family's finances. Her husband was acquitted of all charges in the shooting death of African-American teen Trayvon Martin. "Shellie Zimmerman, the wife of acquitted murder suspect George Zimmerman, today pleaded guilty to a less serious form of perjury in a plea deal that requires her to serve one year of probation," the Orlando Sentinel writes. Shellie Zimmerman in court on June 20. "While under oath, she told Circuit Judge Kenneth Lester Jr. on April 20, 2012, that she and her husband were broke when, in fact, they had taken in more than $130,000 in donations in just over two weeks from Internet donors wanting to help Zimmerman defend himself against the murder charge." According to The Associated Press, "Circuit Judge Marlene Alva in Sanford accepted a deal in which Shellie Zimmerman agreed to plead guilty to misdemeanor perjury rather than the original charge of felony perjury in an official proceeding." George Zimmerman was acquitted on July 13 of all charges in the February 2012 fatal shooting of 17-year-old African-American teen Trayvon Martin. The case drew national attention and sparked demonstrations in many cities after Trayvon's parents and their supporters questioned why Florida authorities hadn't immediately arrested Zimmerman. They said Zimmerman had racially profiled Trayvon. Zimmerman said he shot the teen in self defense.